One of the greatest debut albums by a rock group. What kind of band in 1966 would include a Kurt Weill/Bertolt Brecht song on their first album, or even start the first track with a bossa nova drum beat? 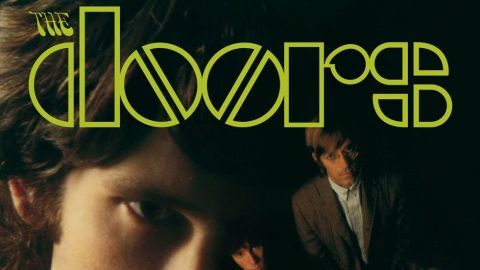 The Doors were unique, then and now, mashing up Indian ragas with blues, jazz, rock, esoteric poetry and a phenomenal songwriting ability. Bottom line: they didn’t have any bad songs. Jim Morrison was the ultimate LSD shaman rock star: dark, poetic and moody; unpredictable and fearless; a sexualised psychedelic, shape-shifting Orphic space captain in the tradition of Fela Kuti, Sun Ra, Lee ‘Scratch’ Perry and other musical avatars of higher power consciousness. Sometimes they veered a little close to the edge of MOR, yet listen to the sevenminute extended version of Light My Fire as it subtly and effortlessly morphs into a trance-inducing cosmic freak-out. Ray Manzarek’s twisted fairground Vox Continental organ motif perfectly counterpoints Jim’s deadpan vocal delivery and the drums get more intense as they build into a Latin-flavoured voodoo stomp. The improvised guitar solo is a beautiful departure, eventually pulling back to the glorious pop chorus, subverted by what now sounds like a quite innocent, naïve if naughty, drug reference, but at the time was so controversial. The End does a similar thing, with an epic, 11-minute catapult into The Heart Of Darkness, a seductive and hypnotic dronelike raga of organ and guitars, a psychedelic hymn and possibly their finest moment. The album opens with an urgent and intense Break On Through (To The Other Side). It’s the anthem for every mushroom stonerhead, concerning every budding bedroom astronaut’s ambition, the soundtrack to psychedelic transcendency… potentially. What also helped set the band, and this album apart, of course, was the amazing production skill of Paul A Rothschild, as well as the great engineering skills of Bruce Botnick. The recordings and mixes are beautiful. All credit too to the late Jac Holzman, who signed the band to his Electra label and deftly supervised the production. After one session Jim dropped acid in a cemetery opposite the studio, returned to smash it up, and only narrowly avoided arrest when Holzman turned up to take personal responsibility, guaranteed payment for all damage and smoothed things over with an irate studio manager. When I was having my own LSD meltdown in ’81, burning money on the Kings Road at the tender age of 21, I’d been listening to Mr Mojo Risin’ a lot, and the music still gives me flashback tingles – it’s that potent. I’d read No One Here Gets Out Alive and wanted the shamanic transformation Morrison experienced and worked for. I understood it’d take commitment and some heroically fearless doses of very strong psychedelics, and I got it alright. Fried to the point of poached, I’m very lucky to have got out alive, with mind intact and able to tell the tale. This is a fantastic package. The vinyl sounds amazing, remastered by Botnick. The notes and photos, in the lavish booklet that accompanies the vinyl and CDs, are illuminating and don’t pull any punches. The live album is interesting, though doesn’t compare to Alive, She Cried or Absolutely Live (or even some bootlegs like Live At The Roundhouse, where some cuts even surpass the original recordings), yet it’s fascinating to listen to an audience, and band, who don’t quite realise just who The Doors are yet. It’d be great to hear the band’s legendary Whisky A Go Go sets, if they even exist. I was honoured to play at the Whisky with Killing Joke in ’82. We did four nights in a row, just as The Doors did, and I was given some very strong LSD from an old hippie cat who, on good authority, had given Jim the best acid back in the day. An unforgettable experience, I still vividly remember being driven out into the desert after one show, to Death Valley, where Jim received his eagle spirit Native American shaman vision. The trip ended in the middle of the Space Mountain roller-coaster in Disneyland, where I swung from the rafters, tripping off my nuts. Twenty years later, after building my state-of-the-art recording studio in Andalusia, Spain, I named it Space Mountain. It now hosts the annual psychedelic Puretone Resonate Festival. So all thanks to you, Mr Mojo Risin’, and The Doors, for all the inspiration.